There are two important measures on the November 4 ballot that will affect California’s future. 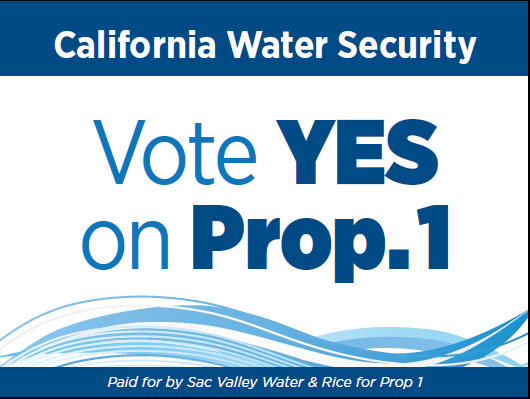 The Northern California Water Association (NCWA) Board of Directors urges you to consider and then vote “Yes” on Propositions 1 and 2. By voting “Yes” for these measures, we can guide California in a positive direction for the next several decades. In sum, these measures allow California to plan for the future and save our precious resources when there is a surplus (both water and revenues), so that we will be able to access them for important uses during both hydrologic and fiscal droughts. As California struggles through one of the worst droughts in history, voters can support Proposition 1, a water bond known as the “Water Quality, Supply, and Infrastructure Improvement Act of 2014.” If passed, the water bond will provide additional water right protections for Northern California and it has $2.7 billion for much needed water infrastructure in California, which could include the construction of Sites Reservoir near Maxwell. The protection of water rights and additional off-stream water storage are critical to provide water security for Northern California and the entire state, particularly during future droughts. The water bond provides a once in a generation opportunity for voters to help advance the water infrastructure (including Sites Reservoir) we need in California to serve our farms, cities, and environment for future generations. For example, Sites Reservoir would divert water from the Sacramento River and its tributaries through existing canals during high flow periods (surplus times, i.e., December, January, and February) into an off-stream reservoir, so the water would be available for use later in the same year or stored across years for drier periods of time, such as this year. Proposition 2 establishes a strong rainy day fund in the state constitution that will force the legislature and the governor to save money when times are good and pay down debts. This will force the state to live within its means and protect against unnecessary tax increases in the future. In good times, money will be placed in a constitutionally-protected reserve and used to pay down debt. In bad times, the rainy day fund can be used to protect schools, public safety and other vital public services. As a sign of the importance of these measures and the careful thought that went into developing these measures, they both passed the Legislature with near unanimity—a bipartisan vote from all parts of the state. In the North State, all our legislators supported both Propositions 1 and 2. This tide of consensus in the Legislature and the Governor’s office shows the importance of these measures to California and its future. Please vote yes for Propositions 1 and 2 on November 4. We hope that you will also encourage your family, friends, and colleagues to support Propositions 1 and 2—saving our precious resources for a time of need.